Paulownias are fascinating plants, nobody who has ever planted them can escape their special spell. Here you will get an overview about the most widespread Paulownia species. The Paulownia Shan Tong is a very fast and straight growing Paulownia hybrid between species P. tomentosa and P. fortunei. It combines the cold resistance of P. tomentosa with the growth rate, the straight stem growth, the narrow crown form and wood quality of P. fortunei. They can be grown both in the colder regions of Germany as well as in warmer regions of southern Europe. Because of their narrow crown more trees can be planted per hectare. The P. Shan Tong is currently the most appropriate type of Paulownia for the investment in ivaluable timber plantations as well as in biomass plantations. It is well-known in Germany under the brand name varieties "Nordmax 21" and "Royal Treeme" which are also hybrids between species P. tomentosa and P. Fortunei. Is the most cold resistant and durable Paulownia kind. It is cultivated in Europe for over 150 years as a decorative tree. It is growing more slowly compared to Paulownia Shan Tong and P. Elongata and remains smaller. Paulownia Tomentosa can be grown on energy plantations, but the use of P. Shan Tong or P. Elongata is rather recommended in this case. The Paulownia 9501 is known as the Shan Tong "Royal Treeme" and "Nordmax 21" ,a hybrid between the species of Paulownia Tomentosa and Fortunei. Its characteristics are very similar to the Shan Tong. The Paulownia Elongata is a fast growing paulownia species with a very straight trunk growth and an average crown. It is suitable for warmer areas of Central Europe like Italy, Spain, etc. Due to their rapid growth, the Paulownia Elongata is suitable for precious wood, as well as biomass plantations. In comparison to the Paulownia Shan Tong, the importance of P. elongata has decreased for the creation of new plantations, primarily due to the smaller crown of P. Shan Tong and secondly to the better area yield of the Shan Tong kind. The Paulownia Fortunei is a very thermophilic paulownia species with a very straight trunk growth and a narrow crown. It is cultivated in warm regions, such as southern China, Southern Europe and Africa. It provides a very high quality wood. The pure P.fortunei is not much widespread today, the hybrid breeding P. Shan Tong is preferred due to its higher resistance. The Paulownia Catalpifolia is a slow growing Paulownia kind. 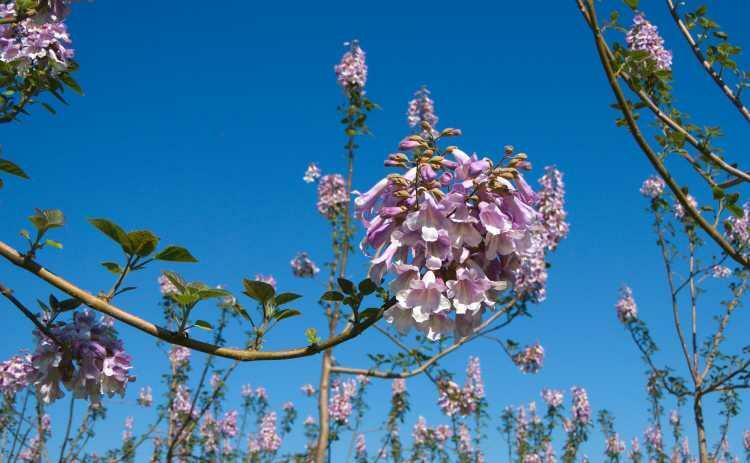 In the first three years, it has a similar growth as other faster growing Paulownia species, and then continues to grow much slower. The increase in thickness happens from the 4th year at only 1-2 cm per year, resulting in tightly growing annual rings. Because of this property it is the most valuable Paulownia sort and is almost exclusively used as plywood. Compared to the wood of fast-growing paulownia species, the selling price is almost three times higher. Here one could expect a crop rotation of at least 20 years. It can be planted in climatically suboptimal and colder locations. The longer the P. Catalpifolia needs to grow, the narrower the growth rings are and the higher the value of their wood is.